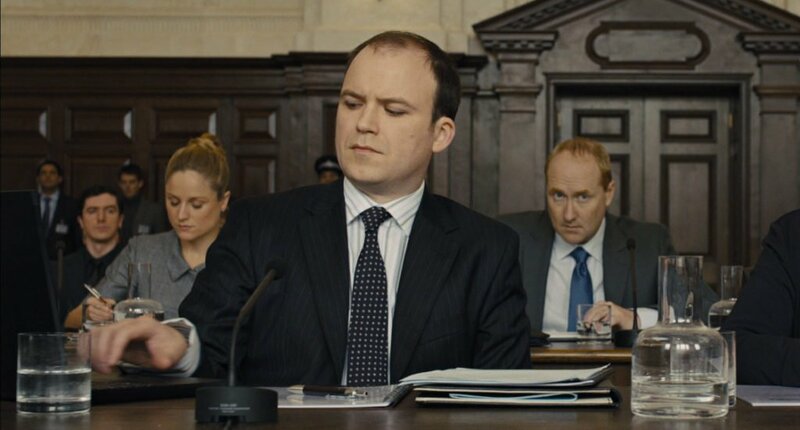 Rory Kinnear, who appeared as M’s aide Bill Tanner in Quantum of Solace and Skyfall, will return to the roll next year in Spectre. 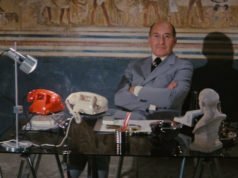 Tanner’s suits in Skyfall have a modern English look; they’re slightly more modern-looking than Mallory’s bespoke Timothy Everest suits but not fashion-forward as James Bond’s shrunken Tom Ford suits. 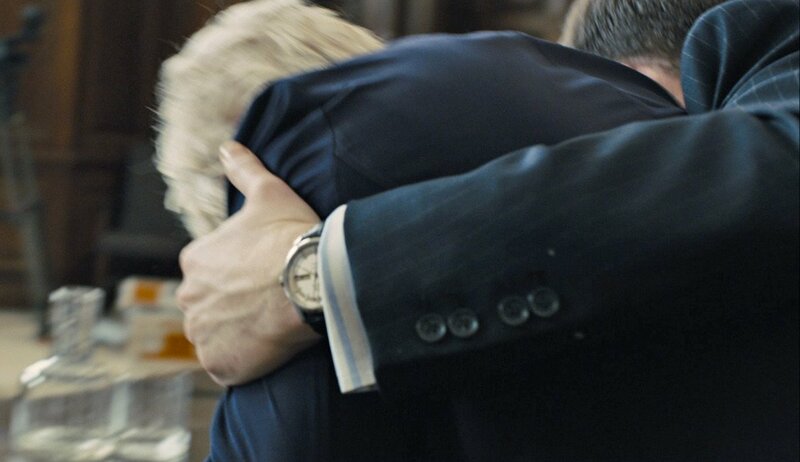 One of Tanner’s three suits in Skyfall is a basic button-two navy suit with grey pinstripes. Grey pinstripes are more subtle than the traditional white pinstripes or bolder rope stripes and chalk stripes, but they’re good for the man who doesn’t want to draw undue attention to himself. The shoulders are lightly-padded, the chest is full and the waist is suppressed. Unlike Bond’s suit jackets in Skyfall, Tanner’s suit jacket is made to a tradition length that covers the buttocks. The button stance is high—a trend that started in the previous decade—but it doesn’t agree with Tanner’s figure. Judging by the pulling around the waist, the suit is most likely ready-to-wear. The jacket has slanted pockets with a ticket pocket, and the front edges of the pockets are rounded much more than pockets ordinarily are. There are double vents in the back. The cuffs have four buttons, with the buttons spaced apart in groups of two. The suit’s trousers have a flat front, low rise and tapered legs with turn-ups. The low rise is most fashionable aspect of the entire suit, and it unfortunately causes the shirt and tie to show beneath the jacket’s button. For the classic Hackett Chelsea cut, think James Bond, who never lets trivial matters such as saving the world from super-villains get in the way of rocking a good suit … It tapers in to define the waist, with double venting used at the rear to ensure that the snug fit doesn’t become constrictive when sitting, or grappling with Russian spies. As you would expect with classic British style, combining subtlety and sharpness is the key here; high armholes accentuate a strong chest, but little to no padding allows the shoulder to gradually slope down, providing a more natural silhouette than Italian suits. 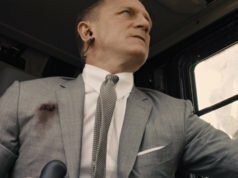 Tanner wears this navy pinstripe suit on two occasions in Skyfall, and he wears it with a different shirt and tie each time. He favours stripes shirts. The first shirt is white with a pattern of thick light blue, mid blue and navy stripes, and the second shirt is mid blue with thick white stripes. Both shirts have a spread collar with medium-length points and a considerable half-inch of tie space. The collar is too wide and short for Tanner’s round head. A more moderate spread with longer points would better flatter Tanner’s face. The shirts have double cuffs. When pairing a striped shirt with a striped suit the stripes need to be considerably different so they don’t clash. Usually the difference is achieved in the scale; the stripes on the second shirt (see below) are spaced much closer together than the stripes on the suit are. Though the spacing of the first shirt’s stripes is similar to the spacing of the suit’s stripes, the much more intense stripes on the shirt prevent it from clashing with the very subtle pinstripes on the suit. The tie that Tanner wears with the first shirt is navy with small white boxes arranged in a grid. The tie he wears with the second shirt is navy with larger pink squares in a diagonal layout. He ties his ties in four-in-hand knots. With all of his suits, Tanner wears black oxfords with a chiseled toe and black Dainite studded rubber soles, and his trousers are supported by black belt that matches his shoes. Well I think it looks a complete mess and the jacket both pulls and looks3 out of shape when buttoned. The buttons could be an affectation showing he has served in the Coldstream Guards. Perhaps that’s where Jeremy Hackett got the idea for his cuff design, but I don’t believe he served. The cuff button arrangement has no bearing on the character since the suit is ready-to-wear. The suit’s silhouette is not bad (trousers rise apart) ,but the fit is ugly. 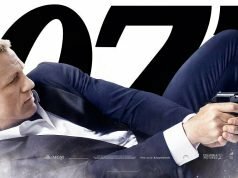 I much prefer Bond’s Skyfall suits to these. As bad as the tight-fitting Tom Ford suits were, these sits are far worse. Terrible. The high button stance and wide sweeping cut from the front buttons to the jacket skirt make the jacket hang on him like a woman’s maternity dress – not to mention that the length could benefit from being about 1/2″ shorter. The low rise of the trousers do not help, but the jacket digs its own grave on Kinnear. In fact, of all the badly fitting suits since covered here – including the atrocities of the 1980s – I can’t think of one that comes across so blatantly clownlike (Moore’s clown suit excused); as if it were worn with humiliation as the main intent, as opposed to a misguided attempt to impress. Oddly enough, Kinnear’s interpretation of Tanner fails to impresses me in a similar way – it’s as if he’s there to deliver lines when the script calls for it, and nobody else is more convenient to deliver it. A mostly characterless, subordinate, new-age yes-man. Just like his suit – there because he’s supposed to wear one. Thankfully, Draco’s nailhead suit in the post immediately below is the perfect anecdote to this abomination. I think that actual fashion for men is one of the worst of ever. Merry Christmas Matt. I think I agree with most of the comments above – this isn’t a well-fitting suit, and Kinnear doesn’t wear it well. The subtle pinstripe is a positive aspect of it, at least. In reality, many civil servants – including senior ones – do dress shabbily, so perhaps this is just a touch of realism. Ugly, ugly–this narrow lapel, skinny tie look for men every man on God’s green earth has got to end. Not sure why the late 1950’s/early 1960’s continues to serve as an inspiration for suits. Tight and ill-fitting characterize too much of what’s seen today. Ohh, and your jacket should cover your arse! Justify that one, please, idiots. I would like to ask you a question. 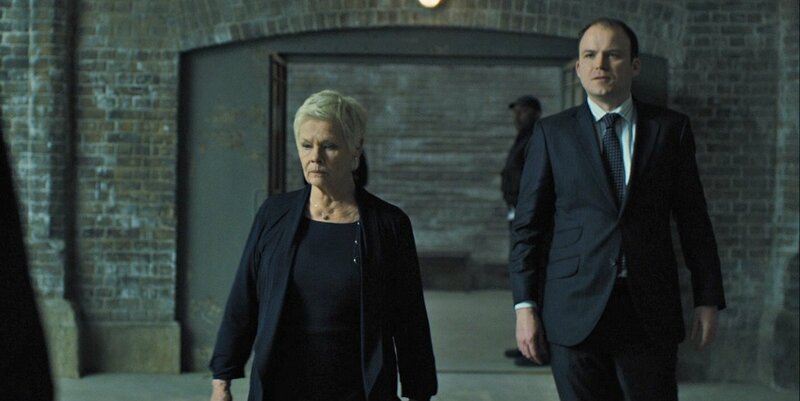 In “Skyfall”, there is a scene when Tanner is seen wears a khaki coat. Could you please explain what type of coat it is, what distinguishes it from other coats (topcoat, overcoat)? When should people wear it instead of other coats? And further details about it. I’m looking forward for your reply. Thank you. He’s wearing a tan cotton-blend raincoat. It’s meant for wet weather as opposed to cool weather when one would wear a topcoat or cold weather when one would wear an overcoat. Raincoats are made of cotton or a cotton blend, while topcoats and overcoats are made of wool or cashmere. A raincoat may have a removable warmer made of wool and/or a synthetic to give it a topcoat level of warmth.